John Sherman was born in 1942 in Camden, New Jersey. Like everyone, John spent most of his life unconsciously searching for the one perfect path out of the wilderness of human life; the one perfect idea, the one perfect thing to think, to understand, to want, to have, to believe, to become that would bring him salvation and satisfaction. The course of John's search was extreme compared to most, but the result was the same: nothing worked; nothing ever does. Late in 1969, when he was 27 years old, John discovered the idea of Social Justice, and set out to become the perfect Communist revolutionary. In 1975, he joined with a small group of anarcho-communist radicals, and embarked upon a series of bank robberies, property bombings, gunfights with the police, two escapes from federal prisons and two years on the FBI's Ten Most Wanted List; all done in the name of supporting the struggles of the American worker for justice. In January of 1976, John was shot and captured during a bank robbery; in March, during a trip to the hospital, he escaped. In March of 1978, after two years on the run, robbing banks and organiing property bombings, John was captured by the FBI. He was tried, convicted, and sentenced to 30 years in federal prison. In March of 1979, he escaped again from the federal prison where he was serving his sentence. He was put on the FBI's Ten Most Wanted List on April 24, 1979. On December 17, 1981, after two years on the FBI's Ten Most Wanted list, he was captured for the last time and returned to prison. In June of 1994, in the fifteenth year of his imprisonment, John had an overwhelming experience of awakening that took him completely by surprise. He spent more than a year and a half in the fully open awareness of spiritual awakening, which then collapsed, leaving him bereft. John spent the rest of his time in prison trying to find something that he could do that would bring him back to the state of indifference and apathy that he had enjoyed prior to that experience. This effort unexpectedly brought him to true freedom by means of an extremely simple act of attention. Three and a half years later, in April of 1998, he was released on parole. Upon his release, he moved to Boulder, Colorado. Carla Sherman (née Vilela Baptista) was born in 1961 in Rio de Janeiro, Brazil. She earned a Master of Arts degree from the Universidade Federal do Rio de Janeiro (UFRJ) [Federal University of Rio de Janeiro] and she taught French and French Literature at her alma mater and at the Universidade Estadual do Rio de Janeiro (UERJ) [State University of Rio de Janeiro]. She worked for over twelve years as a freelance translator and conference interpreter for the French Consulate in Rio de Janeiro, TV Educativa (TVE), and a number of publishing houses and magazines. She also worked for over ten years as a freelance translator for Drei Marc, a subtitling company in Rio. In July of 1997, Carla was a doctoral candidate at UFRJ, preparing her dissertation on French author Philippe Sollers, when she came to the United States to attend a silent retreat. That was her very first time in a spiritual meeting and, on the third day, she had an overwhelming experience of awakening. She went back to Rio for a few months and then came back, this time to Boulder, Colorado. In Boulder, Carla met John Sherman. She went back to Brazil after a couple of months. A few months later, in January of 1999, she came back to the United States, this time to California, where she ran into John again. By then, after a year and a half of spiritual awakening, everything had fallen apart, and she felt completely lost. She started looking for a way to gain back the experience of the oneness of all being. This effort led her to look at herself, although she did not know it at the time. This was the beginning of a process that eventually brought her to true freedom. John and Carla were married in June of 1999, in San Rafael, California. In 2001, they moved to Ojai, California, where they live with their cat, Switters. Carla became an American citizen in February of 2007 and John was released from parole in August of 2007. 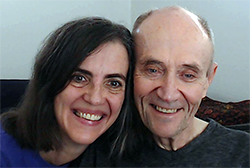 Since 1999, John and Carla meet with people from all walks of life to speak about the fear of life, which is what spoils human life, how that comes to pass, what gives rise to it in the first place, how it manifests in the life in general, and what every person can do to be free of it once and for all. In these meetings, they speak from their experience, listen to reports, and answer questions. John and Carla accept invitations to speak at conferences, companies, schools, libraries, colleges, churches, organizations, etc. They will come and present an introductory talk followed by a Q&A session, or a two-hour workshop, or any other format that will better suit the needs of a particular audience.